Charles Woodson is one of those guys one may want to consider as being lucky because, from the day he was born, he had to mitigate several opposing conditions to become the man he has become today. Born with clubbed (twisted) feet, it didn’t stop him from becoming one of the most decorated defensive players the National Football League (NFL) has ever seen. He retired from the game after 17 years productive years which saw him play for two clubs – Oakland Raiders and Green Bay Packers. Read on to find out more facts about him. Charles Cameron Woodson was born on the 7th of October, 1976 in Fremont, Ohio. His parents are Solomon Woodson and Georgia Woodson who got divorced after his birth. It would seem like he inherited his athleticism from his father an amateur boxer in his youth. Seeing Woodson become a football hero today is nothing short of a miracle because no one who saw him as a child would guess he would turn out a football star. Charles Woodson was born with clubbed feet – a condition whereby a child is born with his feet (or one foot, as the case may be) twisted inwards. He had to wear braces from a very tender age (few months old) till when he was about 18 months old and then they were swapped for corrective shoes. By virtue of his mother’s second marriage, Woodson had a stepbrother, Terry Carter and he was the one who introduced football to young Woodson which prompted his mother to send him to the local YMCA to hone his skills after showing potential in the sports. He enrolled for high school at Ross High School and joined the football team where he excelled so much that his coach made an attempt to let him play on the varsity team as a freshman – a proposal which was bluntly objected to by his mother. However, he eventually joined the varsity football team by the time he entered his sophomore year. In the three years he spent in the varsity team, Woodson earned All-State honors consecutively and created a new school record as he rushed a total of 3,861 yards and scored 466 points. During high school, his athleticism did not only stop with football as he was also involved in track and field as a sprinter (relay races) and jumper (long jumper), and he also played basketball as a point guard. So after high school, it was only natural that there was a line up of colleges wooing him with offers that would sway him to their side but he chose his dream college, the University of Michigan where he played as a cornerback. He was also teammates with quarterback Tom Brady. In his sophomore year, Woodson was offered an opportunity to combine his defensive responsibilities with an offensive role as a wide receiver by the team’s coach Lloyd Carr. He accepted the challenge and executed it to perfection, running about 10 offensive plays each game while still minding his defensive duties. In his junior year, the Wolverines went through the 1997 season without a single loss, crowning it with a Rose Bowl victory over the Washington State Cougars. On a personal note, Charles Woodson won the Heisman Trophy, regarded as the most prestigious award in college football that same season (even though there were many who thought quarterback Peyton Manning, who played for University of Tennessee was more deserving of the award). With that feat, he became the first defensive player – who was not a quarterback or running back – to be given the award. He would later opt out of the senior year to be drafted for professional football in the 1998 NFL Draft. Woodson was selected by the Oakland Raiders in the first round of the draft (fourth overall) and signed a six-year contract with the Raiders worth $20 million. He got into the mix of things at the professional level immediately as his outstanding performances in his rookie season earned him the NFL Defensive Rookie of the Year nod. He enjoyed relative success with the Raiders but was often undone by injuries which limited his performances. He would leave the club as a free agent in 2005 and sign up with the Green Bay Packers on a seven-year contract worth $52.7 million. With the Packers, Woodson won his only championship title – the Super Bowl XLV – in 2010. Even though he started the game, he had an injury to the collarbone which forced him to sit out the remainder of the game, however, Woodson kept on cheering the team from the stands. His contract was renewed after the season in September 2010 with an additional two years, despite the fact that he still had three years running on his original contract which meant he was tied to the club until 2015. The new deal came with a $55 million package. He was, however, released in 2013 and he resigned with his former employers, the Oakland Raiders for the 2013 season. He was moved to play as a safety and he retired from football after three seasons with the Raiders on his second stint. He announced his retirement after the 2015 season and was snapped up by ESPN immediately as a host on their pregame show Sunday NFL Countdown. So Charles Woodson retired from football having become only the second player to scoop the Super Bowl, AP Rookie of the Year, AP Player of the Year, and the Heisman Trophy in their football career (the other being Marcus Allen). 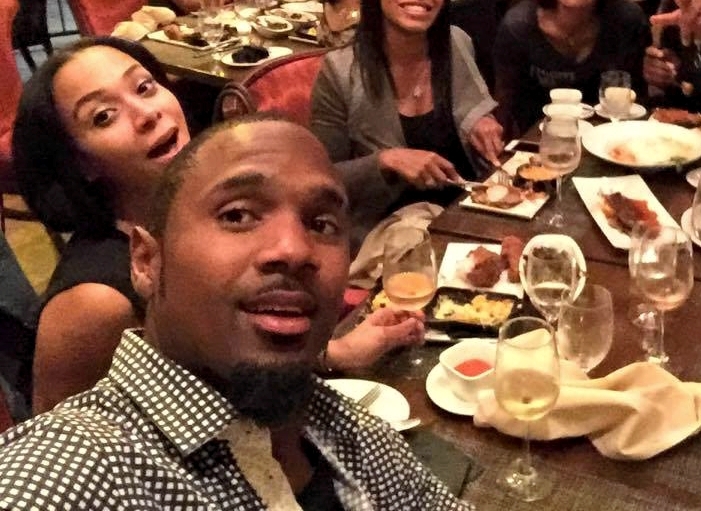 Handsome and retired NFL cornerback, Charles Woodson is off the relationship market. He was yanked off the market by his pretty wife, April Dixon Woodson. The lovely couple, who are bonded by the love they share with each other also have been blessed with children. Woodson and April have two boys together – Chase Woodson and Charles Woodson Jr.